It's unusual to want a one-man business process divided into multiple tasks. These can usually be managed by the star feature in email applications. 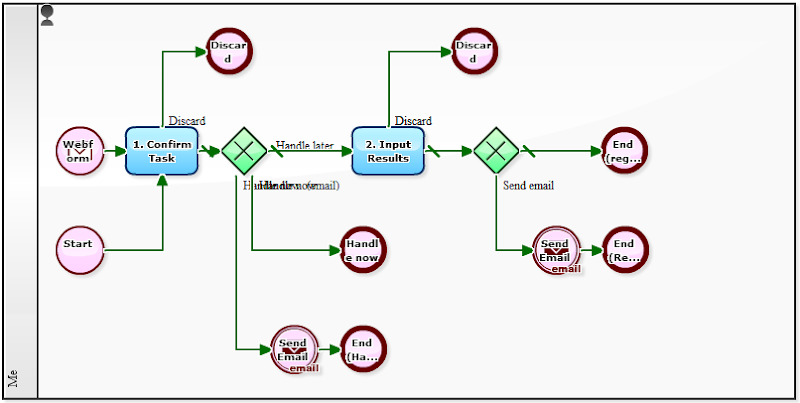 Only when handling processes that include three or four steps (thus are difficult to manage with the on/off star feature) is it convenient to use a workflow system. Today's sample is a case where one person is in charge of operating a consultation service. The incoming data includes "name, email address, phone number, inquiry," and the final output is the "reply" by email. For special cases the consultant may want to follow-up with a phone call. Some inquiries may be dealt with immediately (1. Confirm Inquiry (& reply) –> End), while some may take a while, thus require priority and deadline settings (1. Confirm Inquiry –> 2. Write Reply –> 3. Follow-up –> End). This is helpful in avoiding taking too much time on a single inquiry. As a bonus, the consultant can use monitoring functions to see the number of inquiries and the time it takes to reply. By the way, there is a surprising demand to be able to see individual tasks in to-do lists of workflow systems, even for one-man processes. Especially if you are used to playing tag with deadlines!